Aaralyn stands 5' 9", having a curvy yet lithe body. Her long red hair falls to her waist in soft curls just past her shoulders. She is most often seen within white kilt, white blouse and a brown leather boots that lace to her knees. A simple brown leather belt rests in snuggly against her small waist. She has an ever quiet and soft way to her, and is often heard humming to herself quietly. Her voice has a very lyrical way to it that flows with a gentle ease, it does have a soft Gaelic accent to it. She moves with an almost etheral grace to her, each flowing into the next action. Her once warm turquoise eyes, are now white and very clearly unseeing. She always wears a beautiful silver and gold crafted necklace with a fire opal within the middle of it, as well as a matching bracelet on her right hand. They are both extremely high quality, and of celtic design. Her voice almost has a lingering feeling to it, you can almost reach out and touch it. 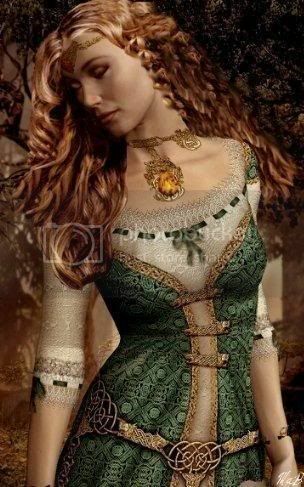 It always moves within a melody, her gaelic accent flowing within it. She is known to go out of her way to help others, and rarely every focuses upon herself. She was taken by the Mage that was working with Breton along with Randall. She came back to the sept carrying him, 4-5 days later. She stayed within the clinic for as long as she possibly could stand being within the four walls. She left Toshi and has been within the forest ever since. She was recently taken by Ray when her Brother Devlin stole his child. This has caused her more then a few issues it would seem. She has remained mostly in the trees since this time. She has a strong dislike for anything with four walls. She has a very almost wild way to her. She is very warm and more then willing to talk to those that are around her.